POLYGLASS is a leading manufacturer low profile, refelctive modified bitumen roofing, waterproofing membranes and roof coatings for low- and steep-slope applications. Committed to adding value through innovation, Polyglass utilizes the most technologically advanced manufacturing processes in the industry with four state-of-the-art manufacturing facilities three in the United States, and one in Italy which services all of Europe. Polyfresko G SA is a highly reflective, self-adhered granular surfaced APP modified bitumen roofing membrane manufactured using patented ADESO Dual-Compound Self-Adhesive technology whereby a true APP compound is applied on the top layer and an aggressive self-adhesive compound on the bottom. Polyfresko G SA membrane performs to Energy Star standards for reflectivity, is a California Title 24 compliant membrane, achieves Class A fire rating and has been tested to ensure long-term performance in the most extreme environments. Polyfresko G SA membrane is listed with the Cool Roof Rating Council (CRRC) with a Solar Reflectance Index (SRI) of 96. Polyfresko G SA membrane features CURE Technology an innovative thin-film technology attributing to exceptional granule retention, stain and discoloration resistance and UV stabilization for long term durability and performance. CURE Technology is solvent-free and environmentally friendly. Polyfresko G SA is constructed with a high-performance polyester reinforcement providing a roofing membrane with exceptional tensile strength and dimensional stability. 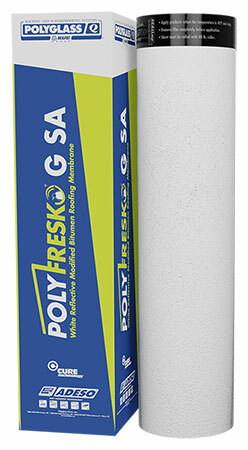 Polyfresko G SA features patented FastLap for granule freeroll ends, as well as SealLap , a factory applied adhesive treatment at the membrane overlap. Each of these patented features provides for greater ease of application as well as improved product performance.